Although she's a Wicklow girl like me, Catherine Fulvio loves all things Italian and marrying a Sicilian, the very dapper Claudio, was the start of her amore Italiano. 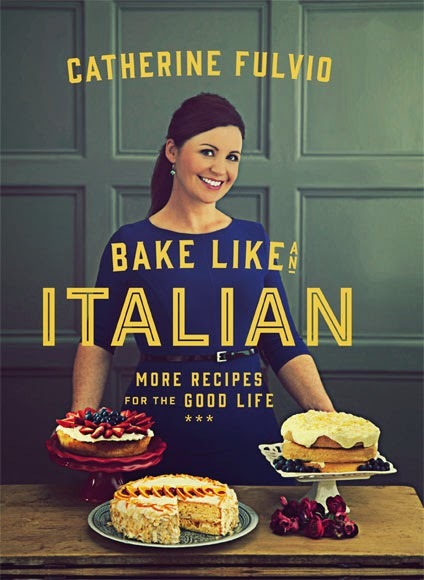 She's written four books already, all with a very distinctive Italian influence and this fifth offering, Bake Like an Italian, explores baking. Anathema to carb haters, it's subtitled "more recipes for the good life" and is definitely written with la vita è bella in mind. There's a very vintage feel to the book cover with three very home made cakes and beautiful panelling in the background. Inside, more delights await with Graham Thew in charge of design, Harry Weir on photography and new author Kristen Jensen as editor. Together, they've helped to create a beautifully illustrated and cleanly edited book which is a pleasure to peruse. Catherine has written pages and pages of guidelines and notes to equip readers with the equipment, supplies and knowledge they need before baking. This attention to detail ensures confidence in each recipe. Speaking of recipes, I like how each one has the Italian translation and the serving size of each alongside. I also like how she calls a panino a panino (one of my pet hates is seeing these lovely sandwiches advertised in the plural form, panini, rather than the correct panino). Yes, I'm a picky mare. And I'm glad Catherine is too. Recipes cover sweet, savoury, pasta bakes, pizzas, seasonal Easter and Christmas treats and bakes for the bambini. All are clearly written and easy to follow so you should have lots of fun trying out new baking ideas at home. I'm off on holiday next week - on an Italian cruise, of all things - and I'm looking forward to eating a lot of piadine, carta da musica and baci di dama myself.